The average number of Internet-connected devices per household is expected to increase five-fold by 2022, leading to potentially over 50 billion connected devices by 2025. As more devices are connected to the Internet– in our homes, offices, and manufacturing facilities – it is becoming increasing more critical that people have access to reliable, secure, affordable, and clean electricity to power them. And U.S. firms that provide the products and services to meet these grid modernization needs are seeing increased global interest. Earlier this year, we released an Update to the 2016 Smart Grid Top Markets Report. These articles offer detailed analysis of the near-term growth potential for U.S. exporters of smart grid products and services overall and for three sub-sectors: transmission and distribution (T&D) equipment, smart grid information communications technologies (ICT), and energy storage. The Update expanded the number of ranked international markets for U.S. exporters from 34 to 50 markets and ranks them according to opportunities. Across the suite of sub-sectors, U.S. exporters remain global leaders. Deployment of these advanced technologies across the United States to modernize our grid is serving as a global test bed for these disruptive technologies. Nowhere is this more apparent than for energy storage systems. Today, the United States is one of the global leaders in deployment of energy storage with more than 200 battery projects totally over 400 MW added to the system and remains the world leader for testing innovative policy, regulatory, and business models. However, projects are being deployed across the globe with global deployment of energy storage expected to increase seven fold over the next five years. This presents a key export opportunity for U.S. manufacturers and service providers. Over the last eight years, the costs of grid-scale battery energy storage has decreased ten fold. These types of cost reductions are driving the deployment of a wide range of energy storage systems in the United States and around the globe and enabling electric utilities to store electrons (electricity) to provide power when it is needed and help steady the 24/7 need to balance the generation and the demand for electricity. As a result, the Trade Promotion Coordinating Committee on Renewable Energy and Energy Efficiency (TPCC-REEE), and the U.S. Departments of Commerce and Energy are leading an interagency effort to enhance services and programs to support U.S. competiveness in a range of sub-sectors across this diverse industry – including for energy storage. In the 2016 Smart Grid Top Markets report, the Department of Commerce included dedicated analysis on energy storage to increase market intelligence for U.S. exporters, and our January 2017 Update included the first sub-sector rankings for energy storage exporters. Additionally, at DistribuTECH 2017, under the International Buyer Program, the Department of Commerce led delegations totaling more than 400 foreign buyers to facilitate meetings with U.S. energy storage and smart grid companies, as well as interact with U.S. utilities who have successfully deployed these products domestically. Further recognizing the link between technology deployment and regulatory barriers, we have engaged in a series of market-specific activities. At the third U.S.-India Smart Grid Workshop in New Delhi,I participated in public-private discussions on the challenges to smart grid technology deployment in India. We also held discussions on communications networks for electric utilities in Brazil under our partnership with the Utilities Technologies Council through our Market Development Cooperator Program, and later this year (October 31-November 2), we will be leading a delegation of U.S. firms to Toronto and Calgary for the Renewable Energy Integration Trade Mission. And this is just the beginning! Stay tuned for upcoming events related to global smart grid opportunities, and a full update to the Smart Grid Top Market Report later this fall. Sign up for our Global Energy Team newsletter to stay in the know! As we kick off Small Business Week, the Census Bureau released its “Profile of U.S. Importing and Exporting Companies, 2014-2015.” A joint project of the Census Bureau and International Trade Administration, this series details the characteristics of U.S. companies that imported or exported goods in 2014 and 2015, including information on company size, industry, geographic composition, and trading partners. When we look at the trade data, small and medium sized enterprises play a huge role in economic growth and job creation. In 2015, nearly 408,000 companies in the United States traded goods internationally, with nearly 295,000 companies exporting goods and almost 197,000 companies importing goods from abroad. The majority of these companies were “small and medium-sized enterprises,” or SMEs, with fewer than 500 employees. In 2015, SMEs accounted for 98 percent of goods exporters and 97 percent of goods importers. However, in terms of known dollar value, large companies account for a larger share of trade, with SMEs only accounting for about a third of U.S. goods trade. In 2015, the value of “known” U.S. goods exports (export transactions that can be linked to a specific exporter) fell by 7.7 percent from the prior year, so it doesn’t come as a surprise that the number of goods exporters in 2015 was also lower than 2014, falling by 3.4 percent. This drop is attributed to fewer small company exporters with fewer than 100 employees, as the number of medium-sized (250-499 employees) and large exporters increased slightly. With regard to markets, the number of exporters selling goods to Canada decreased the most, with most of those losses being very small companies with fewer than 20 employees. However, large firms accounted for most of the decrease in known export value to Canada. 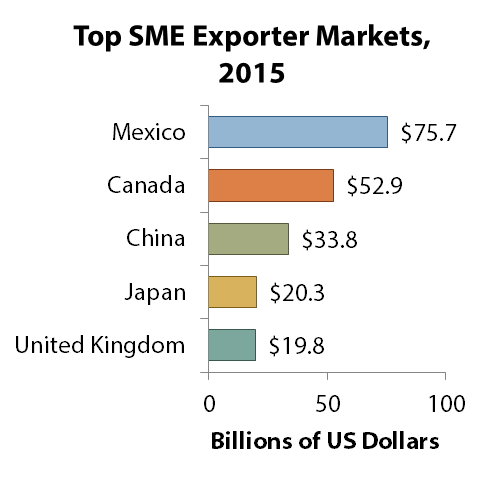 SME exports increased to several of the top 25 U.S. markets: Belgium, Switzerland, India, and Chile. While overall exports to most of these partners fell, higher exports from SMEs to India offset lower exports from large companies to result in an overall increase in U.S. known goods exports to India in 2015. The value of exports from large companies rose to the United Kingdom, Saudi Arabia, United Arab Emirates, and Germany. While many companies solely export or solely import, about a fifth of these companies engage in both directions of trade, exporting and importing merchandise. These companies are also responsible for the majority of the known trade value, accounting for 85 percent of known goods exports and 93 percent of known goods imports in 2015. Similarly, while most companies only engage with one trading partner, those companies selling to partners in multiple countries account for most of exports, by value. For example, the 7 percent of SMEs who exported to 10 or more countries in 2015, accounted for more than half of total SME export value. This is even truer for large companies, where the 44 percent of large companies that exported to 10 or more countries accounted for 96 percent of the overall value of exports from large firms. The data in this report show that many small and medium-sized companies could expand their export sales to additional markets. The International Trade Administration offers many services to help U.S. companies begin exporting or increase their sales. Businesses of any size can contact their nearest Export Assistance Center to find out more about our programs and resources. For more information regarding U.S. importers and exporters in 2015, see ITA’s fact sheet or read the full Profile. Join us in the conversation on social media using #SmallBusinessWeek. Tag us on Twitter using @TradeGov and share the success of your small business. Ken Hyatt is the Acting Under Secretary for the International Trade Administration, Department of Commerce. Now more than ever, U.S. businesses know how important it is to take advantage of export opportunities around the world. From coast to coast, businesses are selling their world-class goods to the more than 95 percent of potential customers who live outside our borders. The 2015 Metropolitan Area Export Overview is a clear indicator of this movement, as many cities have increased exports or even set records. And along with the nation’s largest metropolitan areas sending out more American goods, many smaller areas have also set trade records. Now to the numbers: U.S. metropolitan area goods exports exceeded 1.3 trillion in 2015, and accounted for 89 percent of goods exported from the United States. There were 156 metro areas that exported more than $1 billion of goods to consumers around the world. There were 14 metro areas that exported more than $20 billion of goods in 2015. Let’s look at a couple examples: Seattle-Tacoma-Bellevue, Washington; and El Paso Texas, both of which set records in 2015, have experienced impressive growth from 2009 to 2015. The Seattle area was ranked in the top five for 2015, while El Paso, Texas ranked in the top 20. El Paso registered double-digit export growth in 2015, shipping $24 billion in goods abroad. El Paso has made impressive increases since 2009; this year representing a 22 percent increase from 2014, and a 217 percent increase from 2009. The city’s largest export goods categories included computers and electronic products; electrical equipment, appliances; and transportation equipment. Exceptionally, El Paso area sent 93.5 percent of its goods exported to markets where the United States has trade agreements enforced. The Seattle area sent more than 25 percent of its goods exports to markets where the United States has trade agreements. Their exporting categories ranged from transportation equipment to computer & electronic products to fishing, hunting, and trapping goods. It’s clear that both Seattle and El Paso, among the nation’s many metro areas, large and small, are making developments towards a more globalized market. The Department of Commerce and the Obama Administration continue to focus on supporting U.S. jobs and raising wages. This includes efforts to sign high-standard agreements such as the Trans-Pacific Partnership. Accessibility for U.S. exporters to the largest and most competitive markets has become top priority over the duration of the Administration. In fact, markets with Free Trade Agreements in force accounted for more than half of the total goods exports for 195 metropolitan areas. For more information on the contributions of metro areas to U.S. exports, download your free copy of fact sheets for the top 50 exporting metro areas. A neighbor, an ally, and our third-largest trading partner: Mexico – and its relationship with the U.S. – has never been more important. As part of the ongoing work to reinforce that relationship, Mexico has published a new and innovative National Cluster Map, which identifies areas for investment and job creation and enhances regional economic development between the United States and Mexico. On July 22, 2016, in conjunction with Mexican President Enrique Peña Nieto’s visit to Washington, D.C., the Mexican government released the map as a free, open website available to the public around the world. During his visit, President Peña Nieto met with U.S. President Barack Obama and Department of Commerce Secretary Penny Pritzker, among others, to discuss ways to continue strengthening the U.S.-Mexico relationship. For example, as Mexico is the United States’ third largest trading partner, $1.5 billion in trade crosses our border every day. The site, a key milestone of both governments’ efforts to increase North American competitiveness, is a component of the U.S.-Mexico High Level Economic Dialogue (HLED). Through the HLED, the Innovation Cluster Subcommittee of the Mexico-U.S. Entrepreneurship and Innovation Council (MUSEIC) – in collaboration with Mexico’s National Entrepreneurship Institute (INADEM) and the U.S. Department of Commerce’s Economic Development Administration (EDA) and International Trade Administration (ITA) – has worked to develop binational, compatible cluster maps that identify geographic concentrations of interconnected companies, suppliers, service providers, and associated institutions that are present in the United States and Mexico. The U.S. and Mexican maps can be used to enhance regional economic development by identifying an area’s assets and creating important connections between the public and private sectors. They can also be used by innovators working in similar sectors and spaces to share best practices, identify opportunities for public investment, and serve as a framework for understanding drivers of private investment and job creation. To further the goal of regional integration, President Obama, President Peña Nieto, and Canadian Prime Minister Justin Trudeau committed to establishing a broader North American Cluster Map at the most recent North American Leaders’ Summit held in June to best display synergies among the major regional economies. The development of Canada’s cluster map will be the next step in achieving this goal. EDA, in partnership with Harvard University, runs the U.S. Cluster Mapping website, which offers a member directory that profiles cluster initiatives throughout the country and provides statistical and visual data that assess business environment characteristics. Mexico’s cluster map was developed by Mexico’s Statistics Agency (INEGI) based on 2014 census data, the latest cluster definitions by Michael Porter, Scott Stern, and Mercedes Delgado (also used in the U.S. map) and the location quotients of the country’s 32 states. It combines the Porter, Stern, and Delgado methodology using employment and occupation data, and the Monterrey Institute of Technology and Innovation (Tec de Monterrey) methodology adopted by INADEM to identify strategic sectors in Mexico. Mexico has undertaken a data alignment and cluster definition matching exercise so the data can be used and analyzed in a binational fashion, ensuring the compatibility of the information provided in the U.S. and Mexican maps. Dynamic initiatives such as the U.S.-Mexico binational cluster mapping project offer a powerful knowledge-based tool that can generate clear, positive outcomes for government, industry, academia, civil society, and entrepreneurs. Specifically, the U.S and Mexican cluster maps provide reliable data essential to foster regional and global value chains, support investment decisions, and enforce data-oriented public policy. In fact, a full 40 percent of the content of Mexican exports is comprised of U.S. inputs. This means that of all the products Americans purchase that are manufactured in Mexico, about 40 percent of those products’ value-added components are made here in the United States. This reflects the highly integrated nature of our bilateral value chains. The compatibility of the U.S. and Mexican maps is also a critical step toward the development of cross-border economic development strategies that can help drive the sustainable, long-term economic vitality of urban and rural communities along the U.S.-Mexico border. And most importantly, these maps underscore the importance of using innovative tools to best leverage our connections to create jobs in both countries and across the region. You are currently browsing the archives for the Export Data category.